Share information about winning deals in Teamgate. Improve your team’s communication, spread the good news and appreciate excellent work. 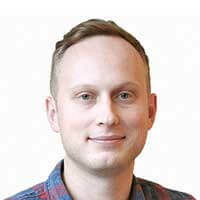 Slack CRM integration enables you to automatically share information about won deals at Teamgate on a dedicated Slack channel, even with people who do not have a Teamgate account. Use Zapier platform to set the integration up following a few easy steps and build the structure of information the way you want. Share good news with a small effort and no extra investment – Set up Slack CRM integration to inform team members about successful deals. 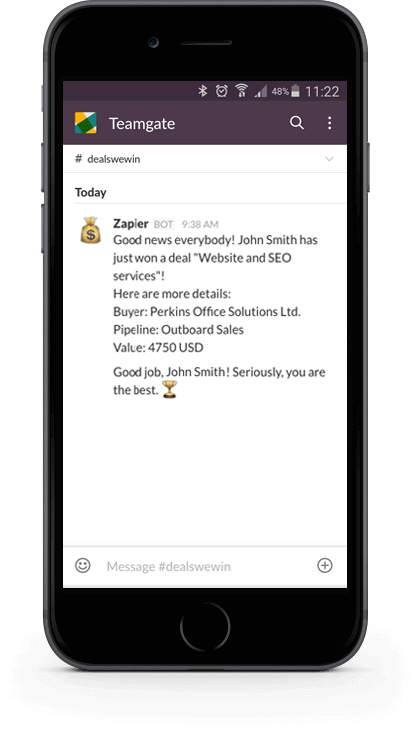 Use Zapier integration, a free platform, to create notification messages, including details about a deal. Use Slack to improve communication – Create a dedicated Slack channel and invite your sales team to join. When a deal is won, automatic message instantly appears on the channel. Information on-the-go – Be the one to “catch” those who move, but can’t live without their smart devices. Slack is a multi-device platform, therefore notifications about successful deals can reach people wherever they are. Appreciate the good work – It is well-known that sales people work in a fast-paced environment and once a deal is won, they start working on another one. Slack integration with Teamgate CRM, pushing real-time messages, will allow you to congratulate your sales reps instantly. Because they deserve this.